Ellen started working at SCVS in 2009 as a nursing assistant, before beginning the journey to becoming a registered nurse. After qualifying in 2015 she spent a year gaining experience rotating through all disciplines, before specialising in internal medicine and imaging. In 2016, she completed her ESVPS certificate in emergency and critical care. 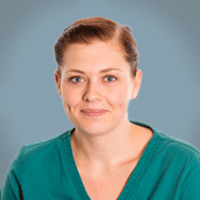 Ellen enjoys all aspects of nursing, but has a particular interest in the management and stablisation of medical patients.